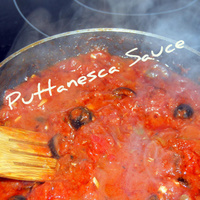 "Sugo Alla Puttanesca" in Italian - literally sauce in the whore's style is a relative newcomer as a pasta sauce. Normally served with spaghetti, it's a great accompanyment to any pasta. 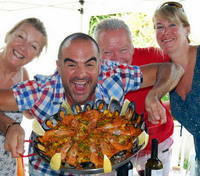 Invented in the 60s in southern Italy it is an easy, quick and cheap way to bring together some of the iconic tastes and aromas of the Mediterranean. Salty anchovies, spicy chillis and aromatic garlic, with plump black olives and sharp capers - the whole topped with fresh Parmesan cheese. Smells and tastes divine and can be put together in around ten minutes. Delight your friends with this Italian classic. Gently heat 4 tablespoons of the olive oil over a low to medium heat in a fry pan. Add the garlic and very gently cook until soft.....do not brown or it will spoil the flavour. Add the anchovies and the chilli, and continue to cook, at the same time mashing the mixture together with a wooden spoon, until an even paste is formed. Add the tomatoes and the rest of the ingredients and stir well. Turn up the heat, and allow to simmer for about 10 minutes. Take off the heat and stir in the parsley. Have your spaghetti cooked, drained and still in its hot cooking pan. Pile the hot sauce into the pasta an mix well. Add the remaining olive oil and a good grinding of black pepper. 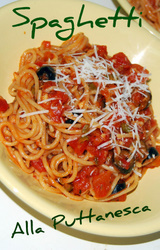 Spoon into warm bowls and serve immediately with grated parmesan and a good bottle of red wine to drink.